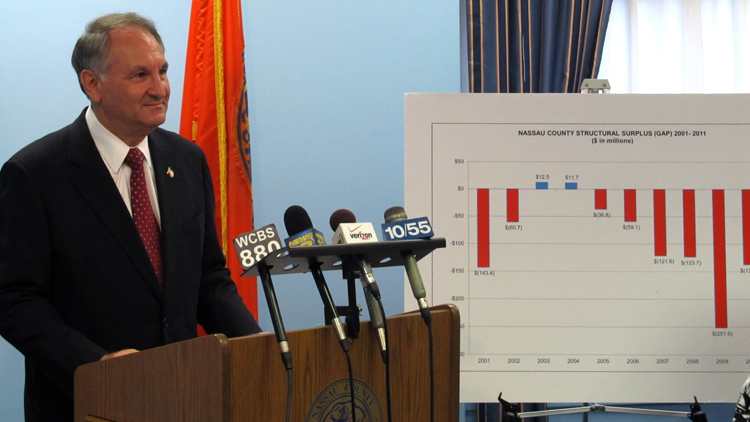 Nassau County could be facing almost a $77 million budget shortfall this year unless immediate steps are taken, warns County Comptroller George Maragos. Maragos, a Republican, issued the warning in his 2014 mid-year financial projection, which predicts that the county’s operating funds could end with a $76.9 million deficit due to a sharp decline in sales tax revenues, lower state and federal aid and unforeseen spending for police overtime. His dire forecast comes weeks before Nassau County Executive Ed Mangano, also a Republican, has to release his 2015 budget on Sept. 15. The Nassau Interim Finance Authority (NIFA), the county’s financial control board, will have the last word on approving the final budget because it took over Nassau’s finances under state law in 2011. Adding to the deficit, Maragos explained, is an estimated $90 million shortfall in sales tax revenue. The Mangano administration, however, is estimating a $51 million shortfall, according to Tim Sullivan, the deputy county executive for finance. “This situation is unfortunate, but not surprising,” said NIFA member Chris Wright, who had opposed NIFA’s recent approval of the county’s lifting the three-year wage freeze on four of the five public unions because he thought there weren’t provisions in place to offset the raises with new revenue or appropriate cost cutting. “It’s exactly what was to be expected—and was predicted by objective analysts—when the county added substantially to its cost base in the face of declining revenues. That the county did so with NIFA’s approval compounded the error,” Wright continued. Jon Kaiman, the former North Hempstead town supervisor whom Gov. Andrew Cuomo appointed to be NIFA chairman, had supported lifting the wage freeze with the hope that Nassau would come up with a plan to raise enough revenues to cover $130 million in new contract costs over the next four years. Wright had warned that the new contracts would cost more than that. Meanwhile Nassau County remains more than $3 billion in debt, according to the comptroller’s office. And that number looks like it’s only going to rise.